A recurring common topic in my home the last week had been about getting a lovebird after the kids visited my cousin's home where they had a chance to play with a very domesticated 9 year old lovebird. On the other extreme of topics, they have also been discussing about giving away some of their things and money to the children who are less fortunate. The boy wanted to do a Ribena stand like what he had done previously to raise money but now living in an apartment, it is not as practical to set up a stand outside our front door! After some thought, I suggested that they bake and sell cookies. 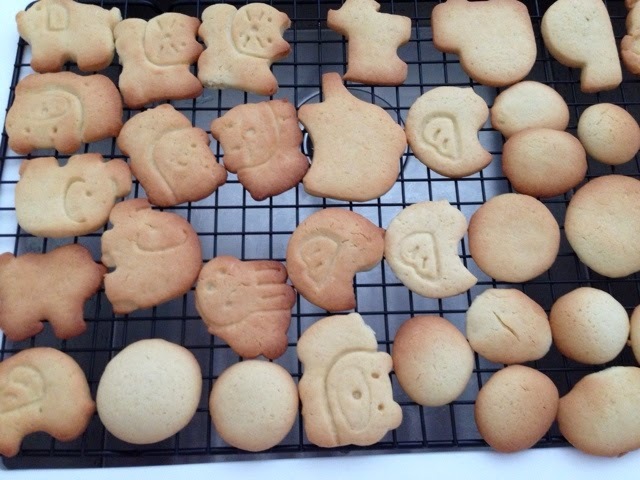 They loved the idea and I settled on an easy sugar cookie recipe for them. This recipe is easy to follow and fun for the kids as well. As the recipe needed the dough to be chilled for 3-4 hrs or overnight, we decided to make the dough at night and bake them in the morning! So on Saturday night, after dinner, I helped the children set up the ingredients. I decided against using my KitchenAid (that would have been too easy) and asked the kids to mix the butter and sugar the traditional method, with their hands. After some mixing, both complained that their hands ache and requested for some help. However, they were both diligent in doing their parts to mix in the eggs and flour. Once all that was done, we put the dough aside to be refrigerated. The next morning, while I was still deep in sleep at 7.30am, I was woken up by a chippy little voice, going "cookie! Cookie! COOKIE!". That was it, my sleep was over! I crawled out of bed and prepared to get the baking started. I took out all the various cookie cutters I have and prepped the little table for the children to cut out the cookie. We spent about 60 mins, cutting the dough and baking tray after tray of cookies. Here are the cookies being cooled. One thing about the recipe though, I will decrease the salt to about half a teaspoon. 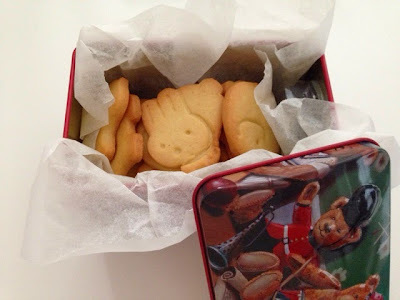 And here's a box of the cookies that was sold to their grandma who is visiting from France and leaving that evening. In order to make the cookies more presentable for sale, I vacuumed packed them for the kids. The girl priced the cookies at $0.50 each which I though was a little expensive but well, it was partly for charity. The children decided, with the help of us, the parents, on splitting the sale 50/50. 50% to UNICEF and 50% to a fund for them to buy a lovebird. 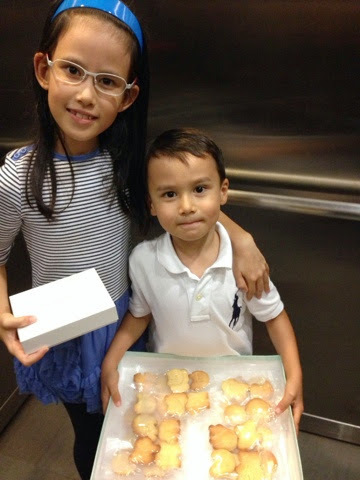 Here they are, getting all ready and excited to go around the condo selling their cookies! Our neighbours were extremely generous! They sold out the cookie within about 6 households! Some bought two packets of cookies! And there we were thinking that they would have to go around all the four apartment blocks. They collected $15.70 for UNICEF and I matched 100% of it for the donation. 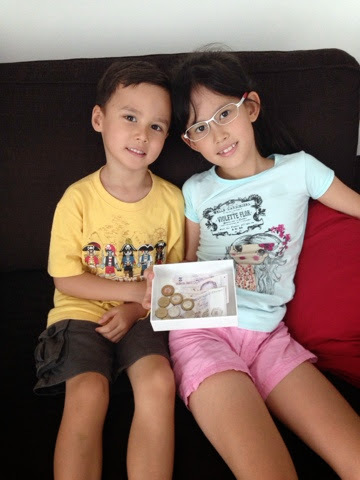 The kids looking happy with what they had raised. I was teasing the girl about paying me for the ingredients I paid and she said no. Initially I was a little disappointed. However, she made me realised how silly I was when out of nowhere, she suggested to her brother that they use the other 50% to buy hubby and I a meal at the restaurant instead of buying a lovebird! How sweet are my children! Anyway, I am thinking of doing another project with them before the start of their new school term in Sept to raise more money for UNICEF. This time, I would like to involve more children. Look out for it!